USER – A user level account is for personal trainers and front desk staff. This level of account can only view account information and personal training clients. The user level cannot add or update member account information so it is not sufficient for sales or club management staff. Additionally, if a user level account is also set as a personal trainer, they will only be able to see personal training clients that are either assigned to them or that do not have a personal trainer assigned. MANAGER – This is your catchall user level, any user who needs to make changes to member accounts (including adding new member account) needs to be a manager level. OWNER – This level is only for trusted employees, an owner level account has access to all Gym Insight account settings including adding and updating additional users. Start by clicking on the location button (house icon) and then selecting Users. 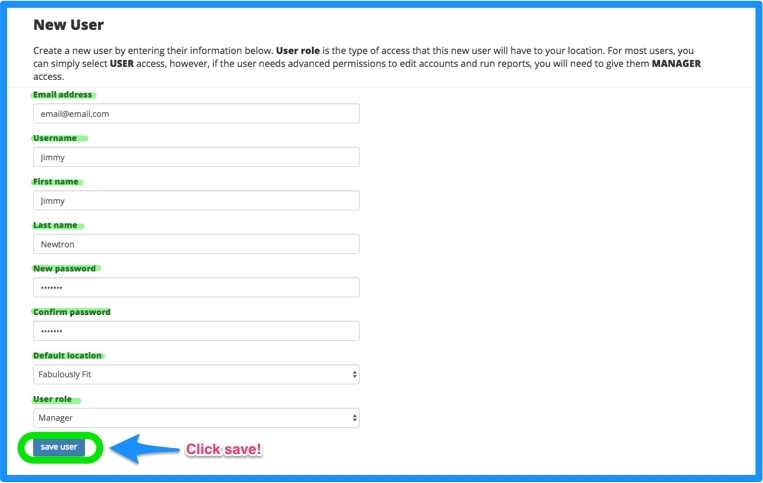 Enter your user details, be sure to select the appropriate level of access for this new user. If you are unsure of what level of access to grant to this user then select Manager unless the user will only be a personal trainer. After you are finished entering the user details, click the save button at the bottom of the screen.